Opening their first restaurant in Canada in 1956, A&W has become one of Canada’s most successful franchises. From delicious hamburgers to onion rings to their iconic frosty glasses of cold root beer, they have made a serious dent in the fast food market. With ambitious plans to further expand their mark across Canada, A&W needed a new franchise recruitment marketing strategy. Sparktank was thrilled to have been selected to help them develop a new franchise recruitment website and online marketing plan to attract new franchisees and reach out to a new generation of entrepreneurs. 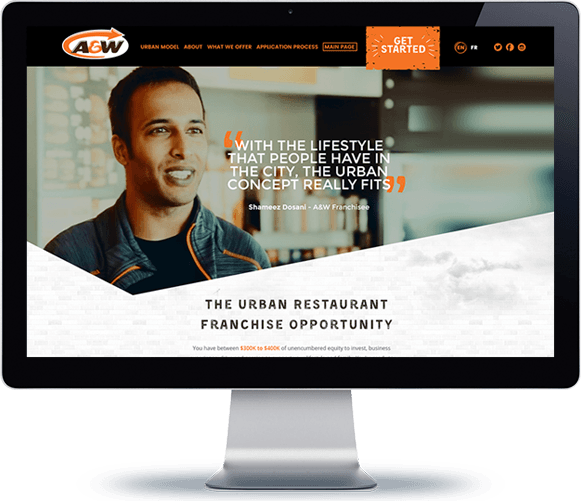 A&W’s franchise recruitment website had become outdated and no longer reflected the brand’s look or messaging. They wanted a new design and strategy that stayed true to their nostalgic look but also focused on getting better conversions in terms of application inquiries. 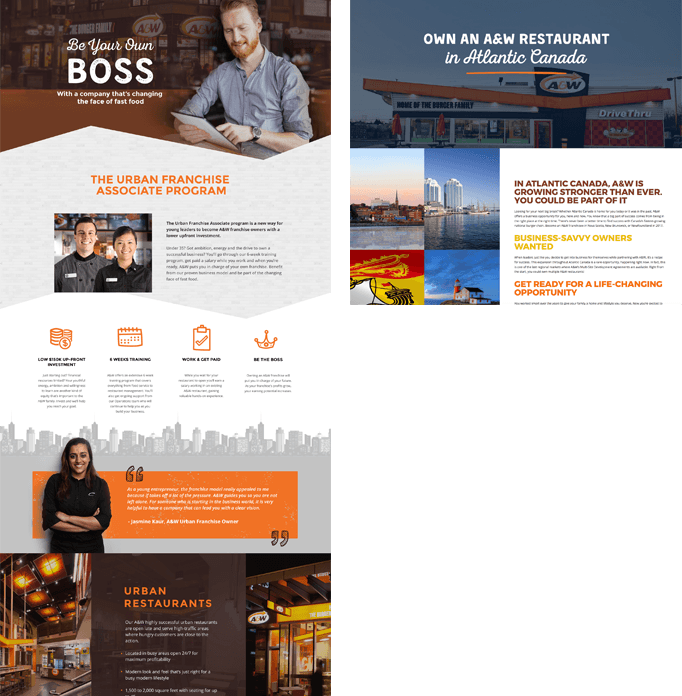 To achieve all these goals, we created a clean and modern bilingual website and a series of landing pages that presented A&W’s various franchise opportunities and programs. We also used video, success stories, and compelling copy to both educate and get candidates excited about the opportunity. THE NEW WEBSITE AND LANDING PAGES WERE A BIG SUCCESS. A&W EXPERIENCED A 100% INCREASE IN FRANCHISE INQUIRIES COMPARED TO THE OLD WEBSITE. A&W had some raving fans among their existing franchisees and we wanted to capture that enthusiasm with real life stories using video. We managed the production of two videos for the French and English speaking markets that combined interviews with franchisees and A&W staff sharing their vision and commitment to ensuring franchisee success. The videos provide a compelling and human element to the websites which can be very effective in helping build a prospect’s confidence in the opportunity. Curious? Go ahead and watch. Having a great website is only half the battle when it comes to attracting quality candidates. You also need to find those prospects and draw them to your opportunity. That’s where online marketing can play a big role. Sparktank is working with A&W on their search engine and social media advertising to build interest in their opportunity and increase their website visitors. Traffic to their website is continuing to build with new prospects inquiring about franchise opportunities and new franchisees joining the A&W family. Working with Sparktank was a great experience for our Franchise Development team at A&W. They are very creative and goals oriented. They really understood our business needs. The results are fantastic, we now generate twice the volume of franchise applicants than we did before.